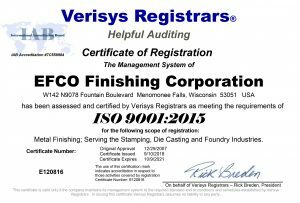 EFCO Finishing Corporation is pleased to announce that we have earned the ISO 9001:2015 certification, replacing the prior certification held for the ISO 9001:2008 standard. A copy of our certificate is shown below! ISO standards are set by the International Organization for Standardization, which is an international standard-setting body composed of representatives from various national standards organizations, promoting worldwide proprietary, industrial and commercial standards. Achieving this standard gives companies the assurances that defined quality and management policies are in place, and that they have been verified by an independent source, or auditor. We hope you’ll find this to be a complement to the high level of service you receive when you work with us! There is a greater emphasis on building a management system suited to each organization’s particular needs. There is now a requirement that top level management and executives now have to be involved and accountable, which aligns quality with a wider business strategy. This can no longer just be delegated to the quality team. Risk-based thinking throughout the standard makes the whole management system a preventive tool and encourages continuous improvement throughout the organization. We are looking forward to continuously improving our company with the implementation of this standard, and excited for the opportunities that will arise because of this. If you have any questions, feel free to give us a call – it’s our pleasure to work with you and continue building our partnerships! 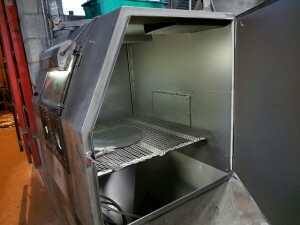 We have highlighted EFCO’s metal finishing services offered in past blog posts, but this post highlights the pickup and delivery services provided by EFCO Finishing. As we concluded 2016, our company truck finally reached the end of its useful life, and was removed from the EFCO fleet. 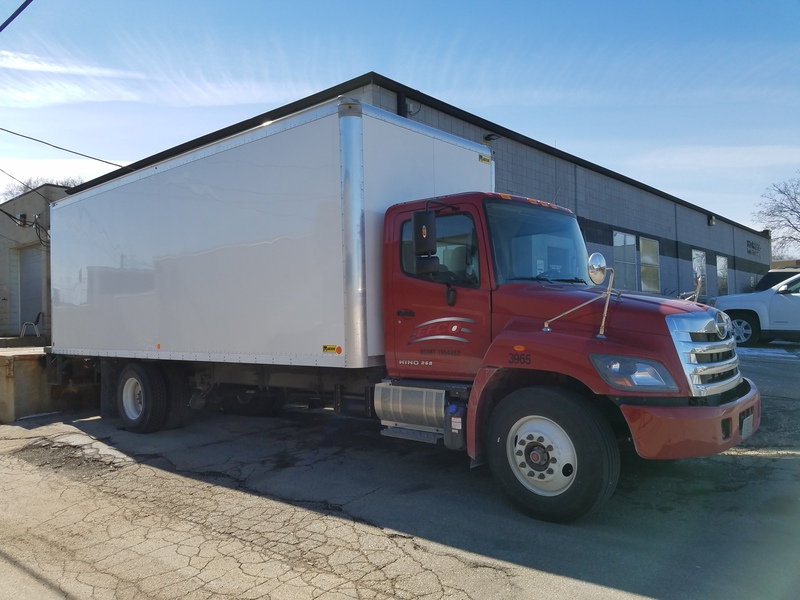 Wanting to maintain this valuable service to our customers, we had a choice to make: buy a new truck or enter into a full service lease. Partnering with our friends at Airoldi Brothers, we went the leasing route, bringing a 2017 Hino 20’ box truck onto our staff. This allows us to focus on what we do best – metal finishing and let’s the experts manage the maintenance and well-being of the truck. Having access to this truck earns EFCO a competitive advantage over other finishing companies. For example, we’re able to pickup and deliver parts more quickly, no longer reliant on a common carrier. Also, we gain greater flexibility, allowing the EFCO logistics team to manage scheduling, rather than a third party who is not a strategic partner in the interaction. We’re able to adjust routes and schedules throughout the day, often helping our customers out of jams. By getting to know the needs and expectations of our customers, we can do our best to be there when they need us there. It makes us proud to have this ability to delight our customers and hopefully go above their expectations, and certainly above most the competition. Serving southwest Wisconsin with a smile, our driver Jim is a valuable resource, getting to know all of our customers. 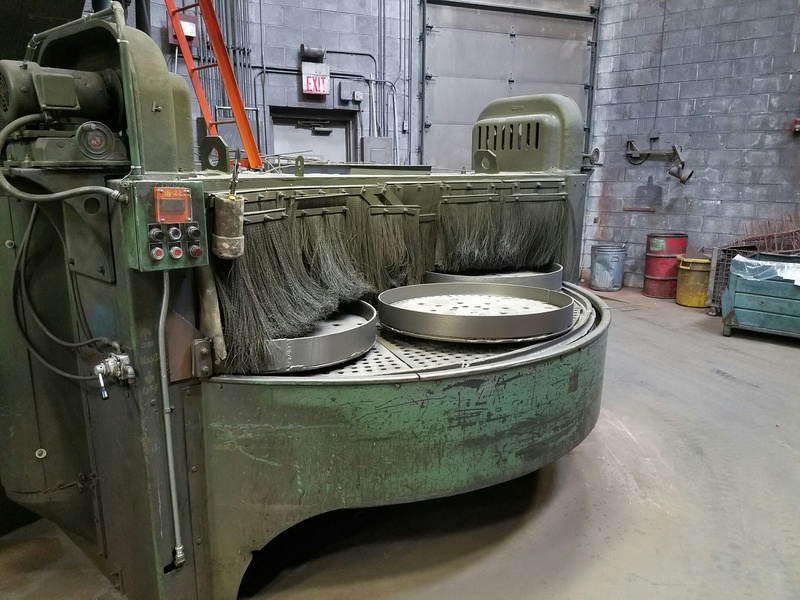 Whether picking up the orders for vibratory finishing, ball burnishing, or blast, he hears firsthand what the requirements are, when parts are needed back on-site, and relays this information back to Jon in production. 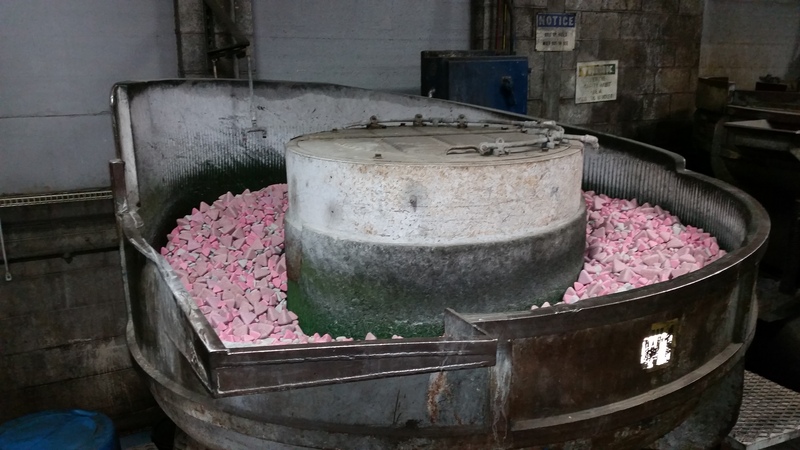 Our efficient, thorough, all-EFCO, start to finish process means a smoother, enhanced experience. 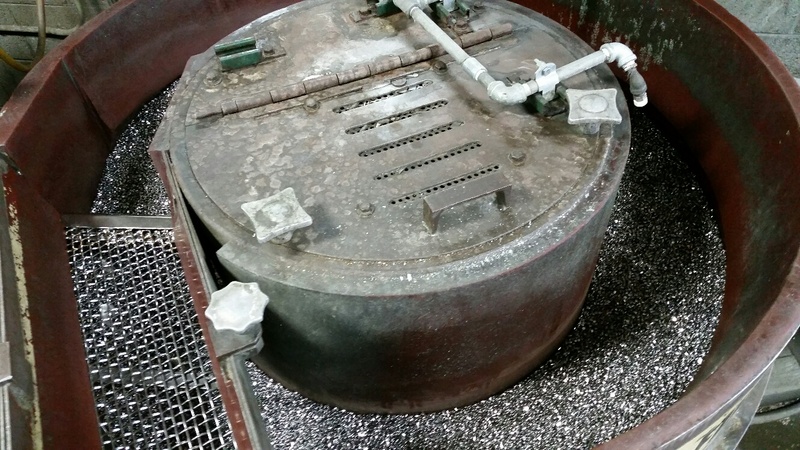 This month’s featured metal finishing service at EFCO Finishing is sandblasting. This term is somewhat generic, with many different meanings depending on who you are talking to or what the end goal ultimately is. 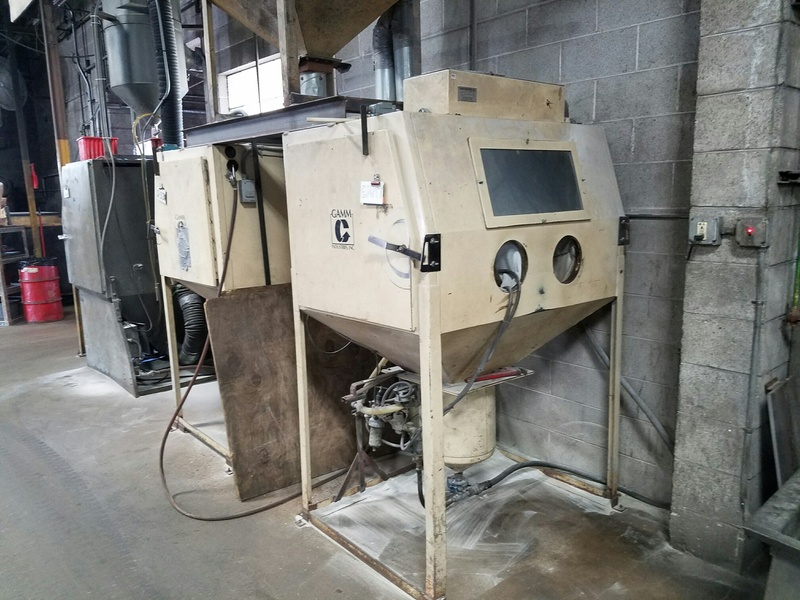 Sandblasting is the process of propelling an abrasive material against a surface using pressure, to either smooth a rough surface, roughen a smooth surface, or remove surface contaminants, such as scale or rust. 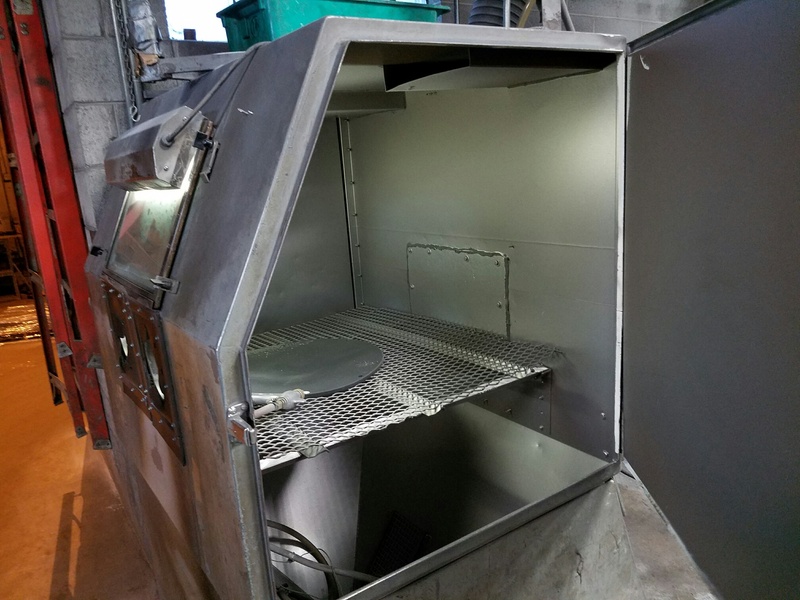 We’re proud to offer high quality sandblast metal finishing in Wisconsin. 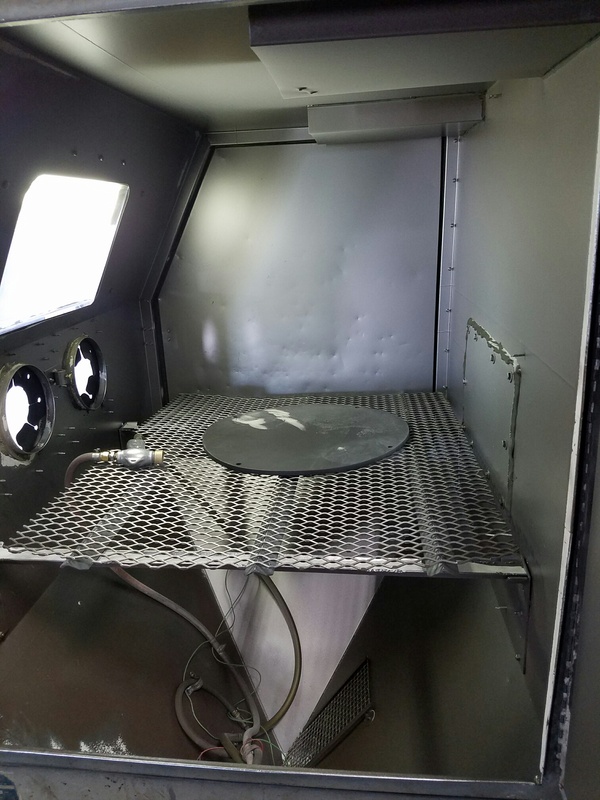 EFCO Finishing offers a wide variety of services that would fall under the sandblasting label, including glass bead blasting, blast room blasting, table blasting and tumble blasting, which can range in aggressiveness from being mild to highly abrasive, depending on the media used. Glass bead blasting uses glass beads to produce a finer finish with more of a sheen or lustre than the other medias. The beads are produced from a lead-free, soda lime type glass, does not contain silica, and is formed into pre-formed ball shapes. Glass beads produce a much smoother and brighter finish than if using angular abrasives. Also, a clean, bright, satin finish is produced without dimensionally changing the parts. Typically, beads can be recycled and reused many times, and are environmentally friendly and chemically inert. 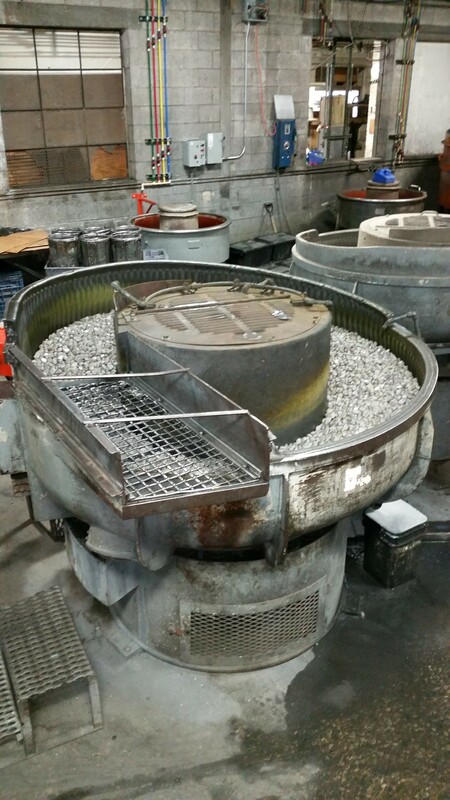 Blast room blasting at EFCO is where we blast our larger pieces, or those too big to fit in a cabinet or in one of the automated machines. 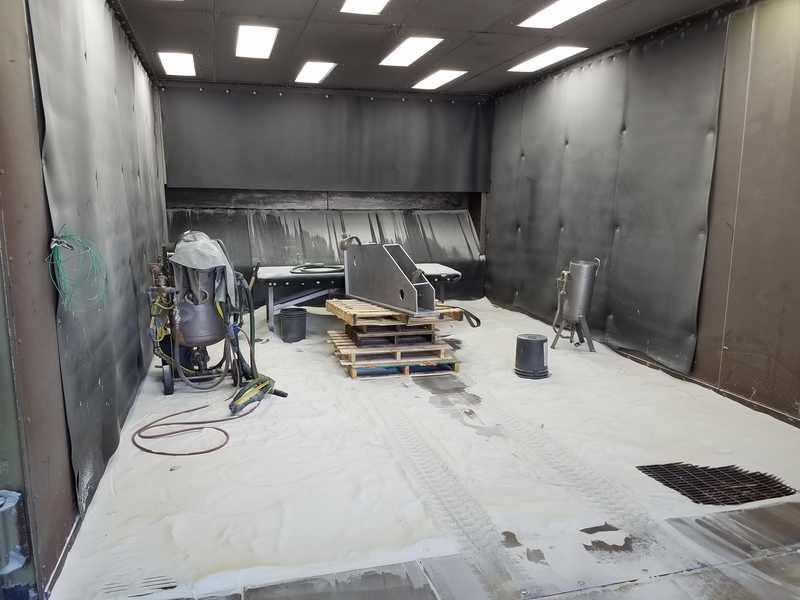 The room is approximately 20’ wide, and 24’ long, which allows us the capability to blast some really large parts. 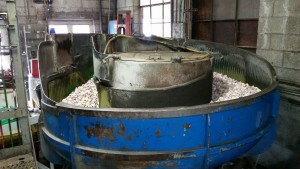 Medias used include glass beads, if a finer finish is desired, or a medium grit crushed glass product, which is sharp and very aggressive and replaced the use of silica sand. This product is made from recycled glass. 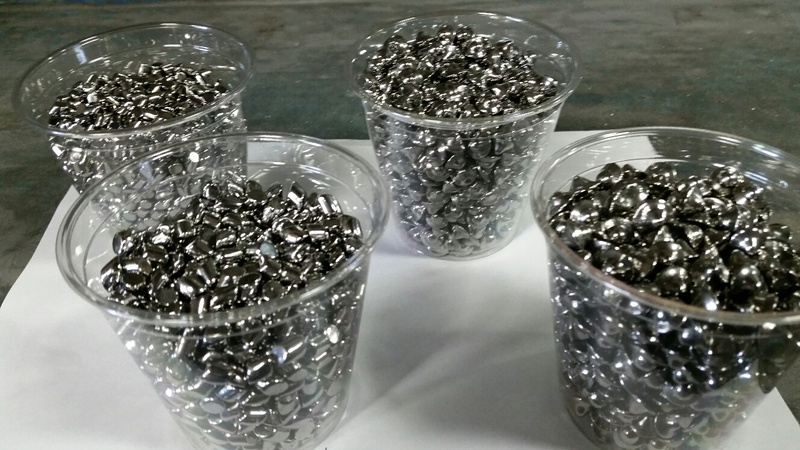 Table blasting is an automated metal finishing process to achieve a blasted finish on parts. As opposed to tumble blasting where the parts tumble on top of each other, in table blasting there is no part-on-part contact, making it ideal for larger parts or circumstances when there are cosmetic requirements of the surface remaining free of any nicks or dings. This process is used as an abrasive cleaning technique to remove burrs, heat treat scale, rust, corrosion, paint, and other contaminants, and it can also be used to prepare surfaces for the next step in the metal finishing process, such as paint adhesion. 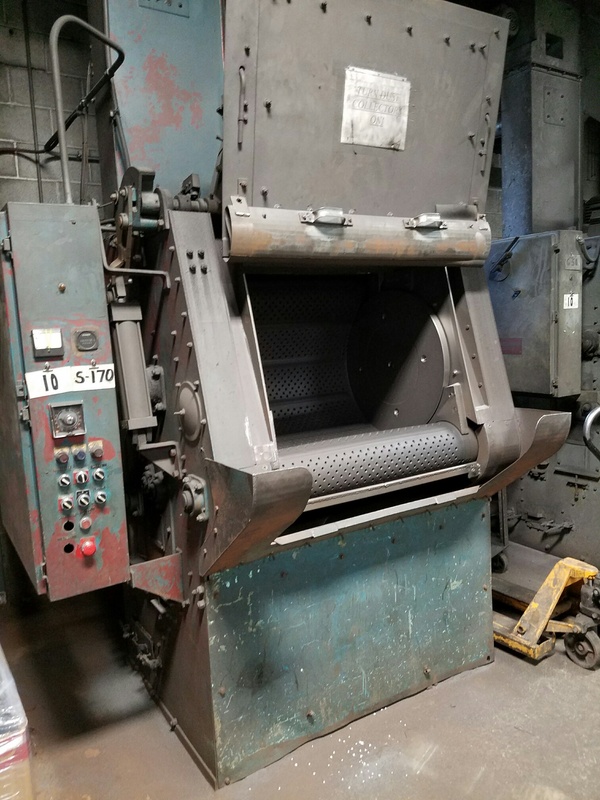 Blast medias available here at EFCO include both steel grit and steel shot, with multiple different machines available offering different capabilities and allowing quick turnarounds of different sized parts. Several machines are available in which multiple parts can be continually fed through the machine. 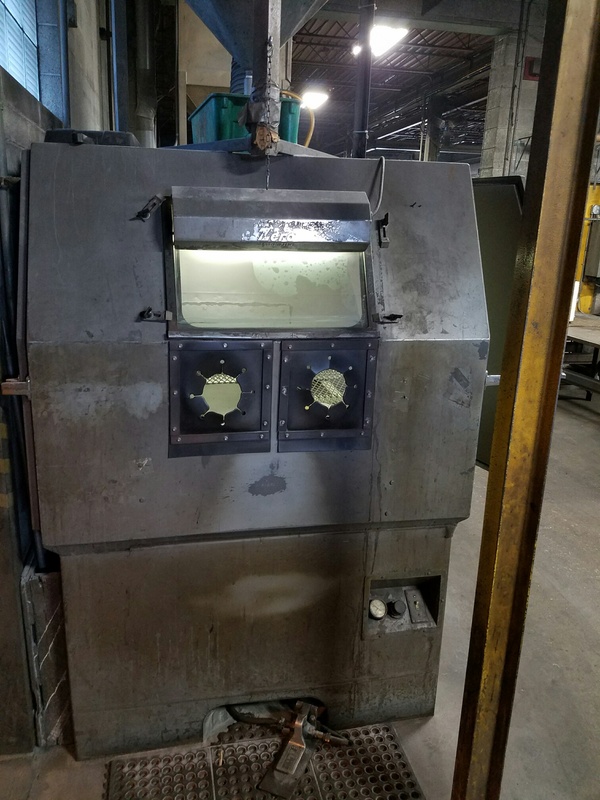 Our largest table blast option is a machine with one large satellite used to run larger parts up to approximately 5 feet, 6 inches in length. The process works as follows: parts are loaded onto satellites, which rotate around the machine and spin in the process. 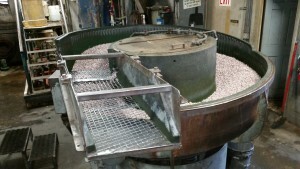 An elevator moves the steel shot or grit up to a wheel, which propels that media onto the parts at a high pressure or force. This area where the blasting takes place in the machine is enclosed, to contain the blast media. 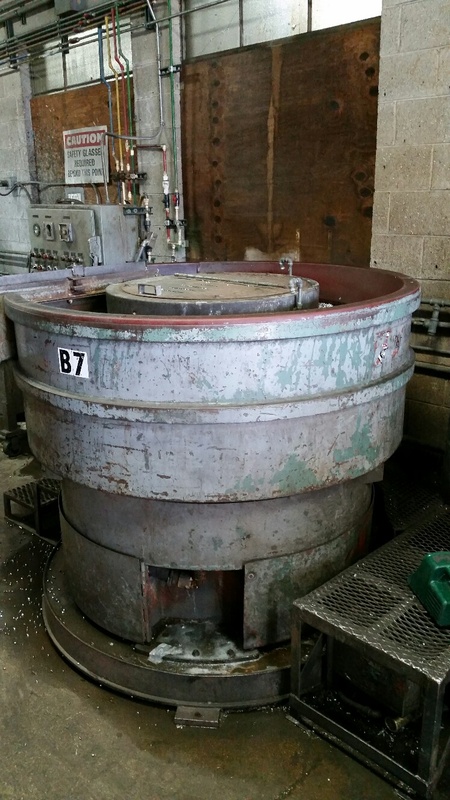 After blasting, the parts return to the starting point where they were loaded and are either flipped for blasting on the opposite side, or if completed, unloaded and repacked into the skid or bin. One pass typically takes a couple of minutes to complete; if necessary, parts may be sent around for a second pass. 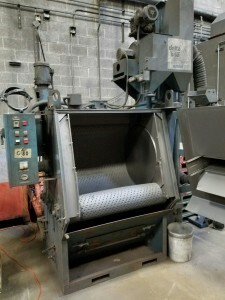 Tumble blasting as a method of abrasive cleaning or surface preparation is commonly used to remove burrs, heat-treat scale, rust, corrosion, paint, and other contaminants, or to prepare the surface of the parts for adhesion. Not meant for all parts, this is a mass finishing process in which the parts tumble on top of each other along with a blast media of either steel grit or steel shot. 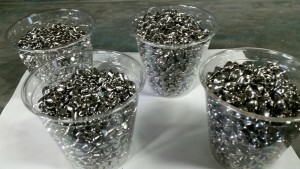 Ideal parts for the process are those that have been heat treated or hardened, and durable enough to withstand the part on part contact and continuous tumbling. The process works as follows: parts are loaded into the chamber of the machine, onto either a rubber or steel belt. The steel belt is optimal for heavier parts and castings, as there is a weight limit for the rubber belts. The door to the machine is then closed, and the parts are ready to be blasted. The back of the machine has an elevator, which takes the shot or grit to a wheel, which uses centrifugal force to propel the media onto the parts at high pressure or force as they rotate on the turning belt. 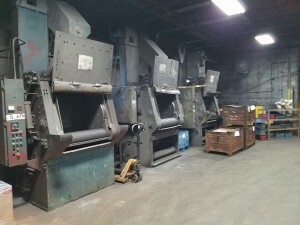 The media is recycled, falling through holes in the belt, with any dust fines picked up by the dust collection equipment. This is considered an airless operation, as no propellant (gas or liquid) is used. At the conclusion of the grit or shot, and in the process cleaning off the parts, which are then unloaded and repacked.desired time cycle, the flow of media is turned off, and the belt continues to rotate, collecting the grit or shot, and in the process cleaning off the parts, which are then unloaded and repacked. 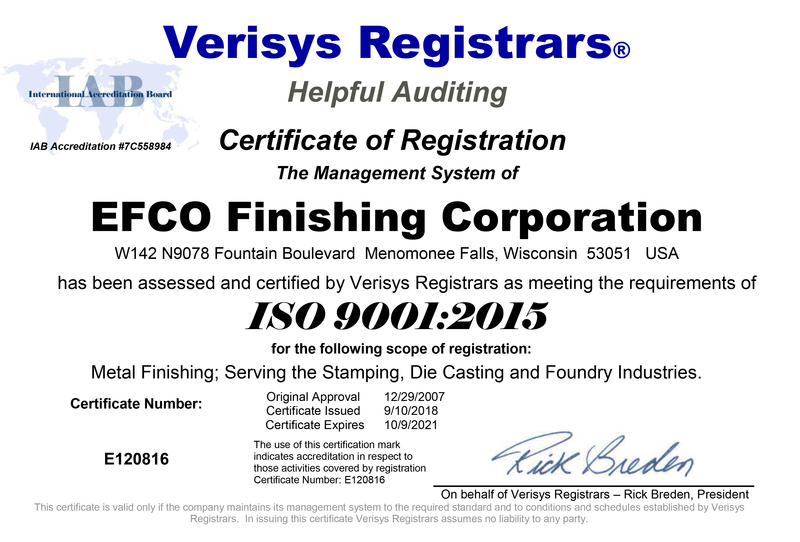 We look forward to supporting your metal finishing needs across Wisconsin & beyond! Looking inside tumble blast machine. When looking for a uniform, clean, bright satin metal finish without changing the dimensions of the part, glass bead blasting is a great choice. EFCO Finishing Corporation has a couple different options to achieve this finish, using glass bead media in its blast room and the several blast cabinets on site at our facility in Butler. Glass beads are made from lead-free, soda lime-type glass, containing no silica, that is made into preformed ball shapes. These beads are known for producing a much brighter and smoother finish than angular formed abrasives. Another advantage is that glass beads can be recycled or reused multiple times. When used properly, in a controlled setting, glass beads provide an environmentally friendly metal cleaning or surface finishing option. Glass blasting is used primarily for finishing, removing light burrs, blending, peening, and removing foreign matter, such as rust or corrosion. It is also ideal for delicate parts, with thin walls and thin welds, as it’s capable of achieving the desired result without causing damage. 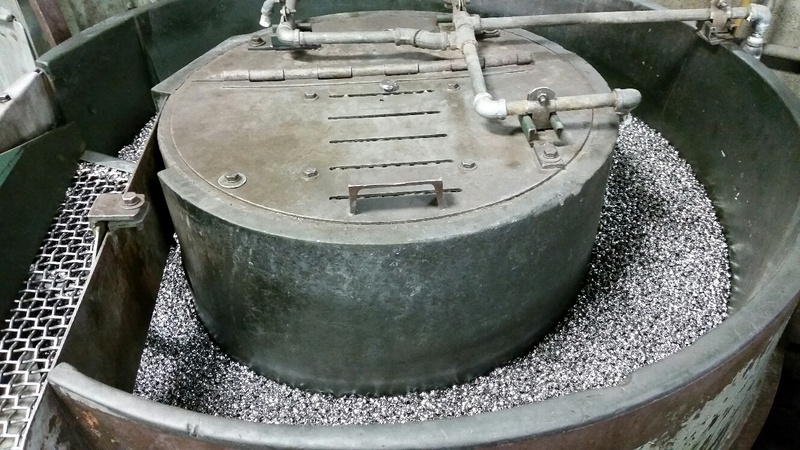 As opposed to steel grit or shot blasting, which is very aggressive, when glass bead blasting, parts are typically handled individually, which avoids part-on-part contact or impingement. It works equally well on many different alloys, including steel, aluminum, stainless steel, brass, and occasionally, even plastics and acrylics. Several different mesh sizes of glass beads are used by EFCO, ranging from coarse to very fine. Sampling the product is often the best way to determine the media, and free samples are always available. Ball burnishing is another metal finishing service offered by EFCO Finishing Corporation with several machines available, ranging from small to large, with a wide variety of different shaped and sized medias. EFCO can achieve your surface requirements and attain the luster, sheen and brightness your project calls for in a timely fashion at competitive prices. 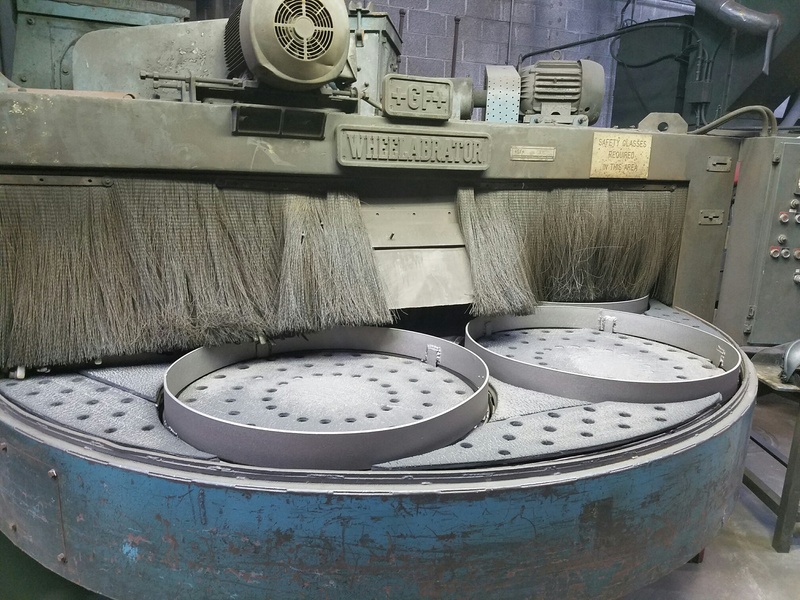 Parts are loaded into a circular style machine, similar in nature to our vibratory machines, filled with burnishing media. 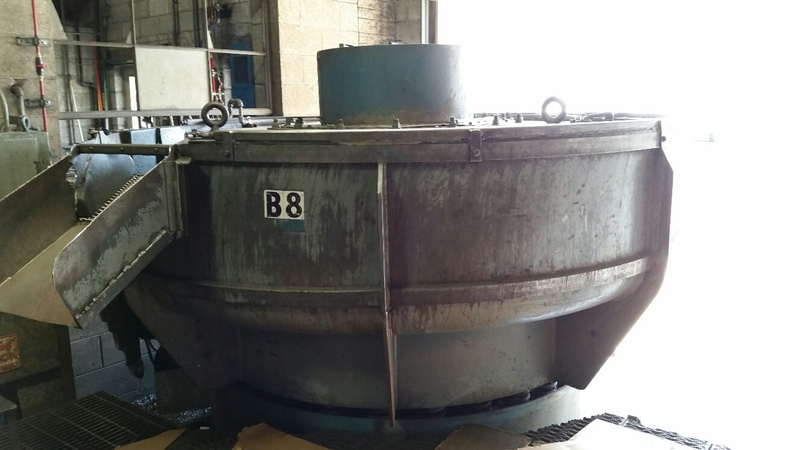 When machine is in operation, the bowl sits on springs on a motor, causing the parts to rotate around the machine in a circular fashion, with the burnishing compound pumped into the machine on a continual basis, and the parts rubbing against the media. 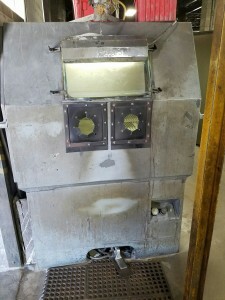 Upon completion, a dam raises in the machine, allowing the parts to travel over a screen to get taken out, and the media to fall through the screen and back into the machine. Parts are usually unloaded into wire baskets, inhibited, and centrifugally spun dry. The burnishing media is made from case-hardened steel media, and as mentioned above, comes in many different shapes and sizes, to prevent lodging in the parts being finished. The media texture is smooth in nature, as opposed to many vibratory medias that have abrasives built into them. Because of this smoothness, no significant deburring will occur. If anything, the burr tends to be rolled, or pounded, over. This is an ideal process where surface requirements are the only critical factor, and not specific to any one industry. Examples of industries served include metal stamping, die casting, tool and die, foundries, aluminum casting companies and several others. Another possible effect is that the weight of the media can actually work harden the surface, or strengthen, the part. This can again be ideal for a number of different industries, many of which were named above. The compound is acidic based, and pumped into the machine on a continual flow, as this is key to achieving the sheen or luster desired. 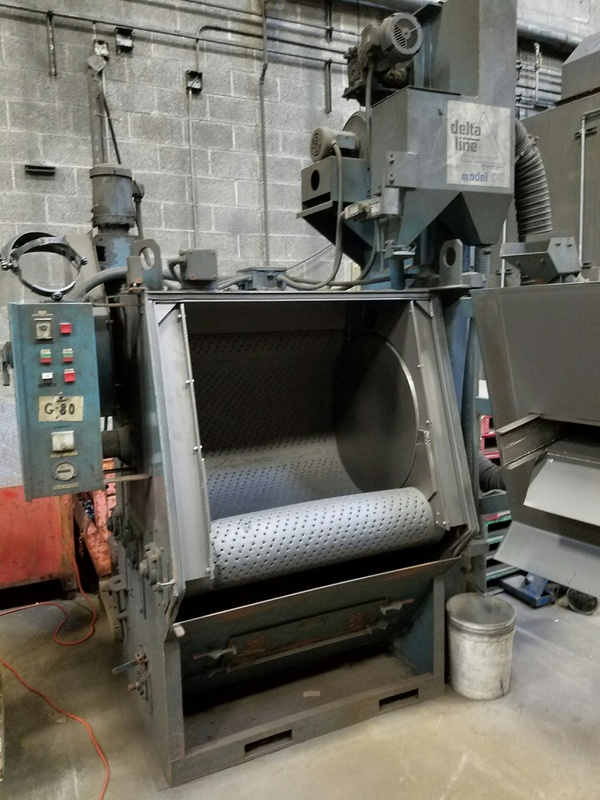 At EFCO, we have burnishing machines readily available, with many different medias to achieve the desired results without lodging. 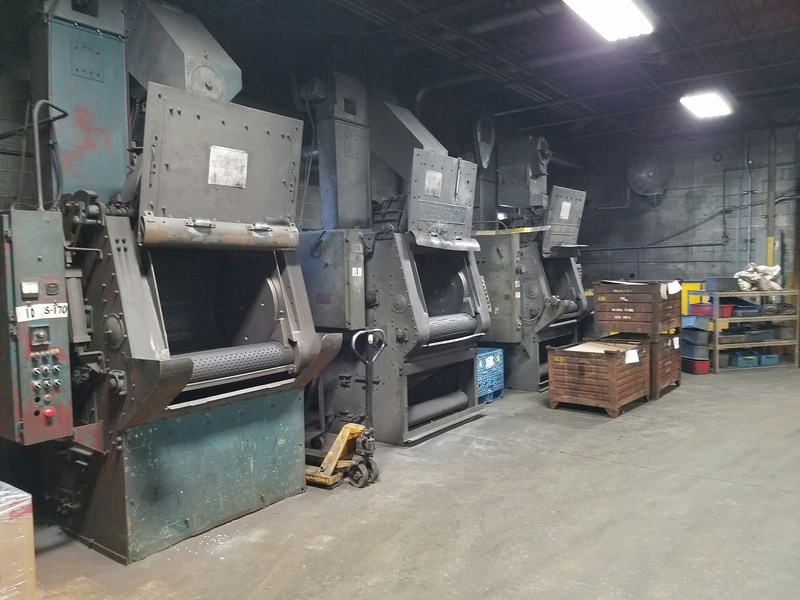 We have processed many different parts over the years, from small parts to large, and we can meet your needs in a timely manner, at a competitive price. We will gladly process no charge samples, so you can see firsthand the range of finishes that are actually available. Contact an EFCO representative today for a quote.